Some of my longtime readers will probably remember when I left Hummus outside overnight. I swear I am such a space cadet (in a cute way) sometimes! Well lately I keep forgetting about him while he is napping. We get home from the gym and I put him down in his crib while I catch up with my friends on social media and the phone or I pin recipes on Pinterest (I adore Pinterest!) and the next thing you know, hours have passed and the older kids are home from school and have gotten themselves a snack and done their homework and maybe made a lil’ sandwich for dinner for themselves and bathed and gone to bed and I remember Hummus! He is such a good baby and doesn’t even bother crying anymore. Today I guess he decided to come find me and somehow got out of his crib and fell down the stairs. I guess that will teach him a lesson! I think he is okay. Hopefully he won’t try THAT again! What a silly baby. By the time I found him it was bedtime, so I put him right back in the crib. Tomorrow I may have to tie him down or something, just to keep him safe. 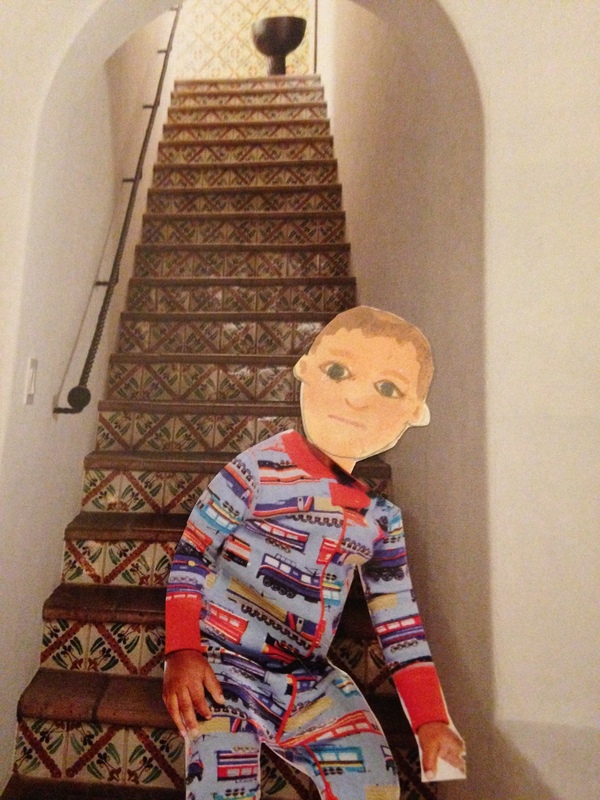 This entry was posted in Fun Times and tagged bedtime, Hummus, napping, stairs on February 11, 2015 by mythreeangles. I used to read about these neglectful mommies (not that you are, just that it reminds me) and WISH my kids would let me neglect the, golly they are always up on me and it can be very annoyinggggggggg!!! You shouldn’t tie him down though, you might get in trouble, someone in KY did just that and got ACTUAL JAIL TIME, they were tying their kid to the bed AT NIGHT when she would be sleeping anyway! and they got in trouble because of the MEDDLING GOVERNMENT. That is outrageous. A mama just trying to keep her little safe, and she ends up in jail. I have seen these sort of cages you can put over the top of the crib, maybe I can find one of those. If all else fails I make a special treat out of Benadryl and yogurt for him sometimes and I don’t hear from him for hours! Well, experience *is* the best teacher. Yes, hopefully he has learned his lesson. Is Robert out of town again? That Hummus certainly is a gorgeous little monkey! No, Röbert (learn to spell it right), is NOT out of town. He is at home and completely infatuated with me. Hummus takes after me…beautiful and with a great head of hair. I am hoping that Beefeater will be gone soon. No reason for saying that but he is looking sickly, I think. i have heard that wild animals sometimes die because they eat the rat poison people leave out to protect their homes from dangerous and disease carrying rodents. is that what you think happened to him? Of course no rat poison. Does that really work? I read a wonderful blogpost from someone who does something similar – is Hummus still in diapers? If he is, try triple diapering him so as to keep him protected! I keep him triple diapered at all times except when he is at the child care at the gym. I have him in regular underpants there so they can earn their keep by potty training him. Let me know if tying works. Mayzen Harvard also sneaks out of bed. Is it too much to ask for a 5 hour nap so I can watch tv and snack? I think not! I know. It is very inconvenient to have to run upstairs and then he makes so much noise when I am trying to watch my shows.